It is cold and rainy here today. It seemed like a great day to snuggle up and color a Fall themed adult coloring picture. 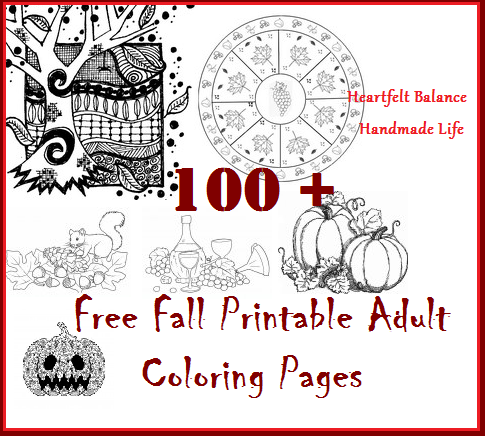 I've compiled a list of websites that have free printable Fall themed adult coloring pages for you to print out and color. It's been way too long since I've gotten my hands on some fine-tipped markers or colored pencils. It's about time. If it's time for you to relax and enjoy some meditative coloring, here's a collection of more than 100 coloring pages for you to enjoy. You can find many cute Fall coloring pages at Coloring Pages for Adult. They have 73 designs to choose from! They range from simple pictures to pages with intricate detail. From baskets of apples or grape vines to mushroom identification or Falling Leaves, you're sure to find something to color here! 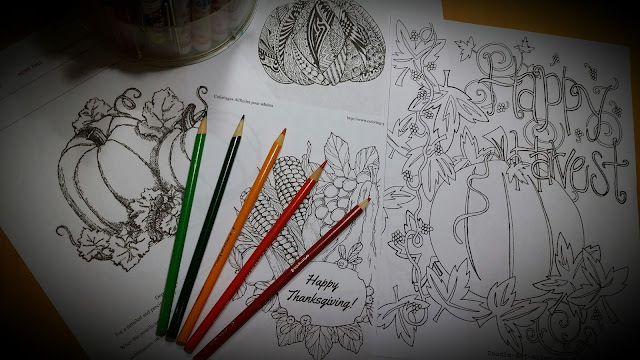 I love the intricate Fall scenes with trees and the grape and wine coloring pages. I could be coloring all the way into Winter! The Coloring Life website has 12 cute Fall inspired adult coloring pages, including mushrooms, squirrels and Fall leaf Mandalas. I personally love the patchwork pumpkin. At Pat Catan's website, you can find three printables for Falling Leaves, Patterned Pumpkin, and Spooky Skulls and Spiders. 16 Free Printable Adult Coloring Pages for Thanksgiving and 35 Halloween Free Printable Adult Coloring Pages. This looks like a fun website to frequent. You can "meet" the artists and you can color your pages and upload your design to the website! Fun. Morningkids.net has 8 Fall Mandala coloring pages that you can print for free. Doodle Art Alley has 6 Fall-themed coloring pages that you can print, although they're not as easy to print as some of the pages listed above. There are a couple more "hoops to jump through" because of the way they are shared. Which was your favorite coloring design from these pages?